National Institute for Standards and Technology Study (2010) conducted a study regarding standards for personnel needed to effectively operate at a structure fire. Their findings in brief state that 4 man crews complete their respective tasks 25% faster than a 3 man crew. Click here to view the National Institute for Standards and Technology website. –Smoke alarms save lives and money. 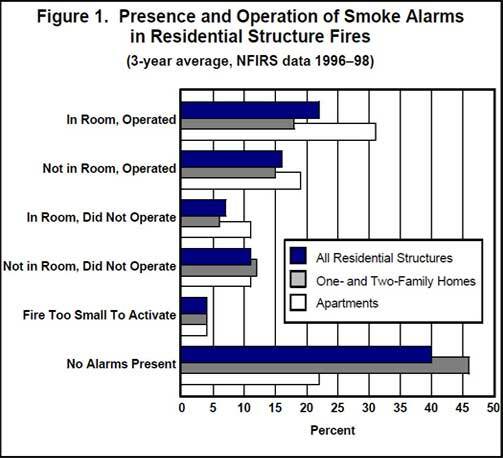 –38% of residences had an operable alarm during a fire, but these fires accounted for only 8% of total property loss. 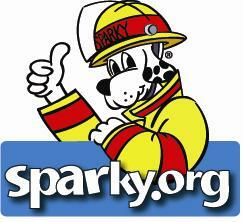 –Only 6% of U.S. homes are not equipped with smoke alarms, yet 40% of residences with fire had no installed alarm. –Alarms operate with more frequency in apartments than in one-and two-family homes. The reason may be that professional property man¬agers are generally responsible for maintaining the alarms, not the apartment dwellers. 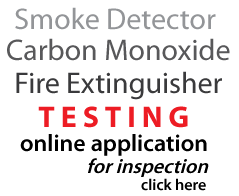 –Multiple-fatality fires are less likely to have working smoke alarms. Smoke alarms in residences are of two general types: ionization and photoelectric. Ionization alarms monitor the level of ions (electrically charged particles) in the air. They are generally sensitive to small smoke particles, which are produced by flaming fires. If present, these particles conduct a current within the alarm’s chamber, activating the device. Photoelectric smoke alarms use beams of light and sensors to detect the presence of larger smoke particles (produced by smoldering fires), which interrupt the light beams and trigger the alarm. Click here to view the U.S. Fire Administration website. — In 2001, the elderly (over 64 years old) represented 12% of the U.S. population but suffered more than 30% of all fire deaths. –The relative risk of individuals aged 65+ dying in a fire is 2.5 times greater than the general population. The risk worsens as age increases: the risk is 1.8 for adults aged 65–74, but soars to 4.6 for those over age 84. 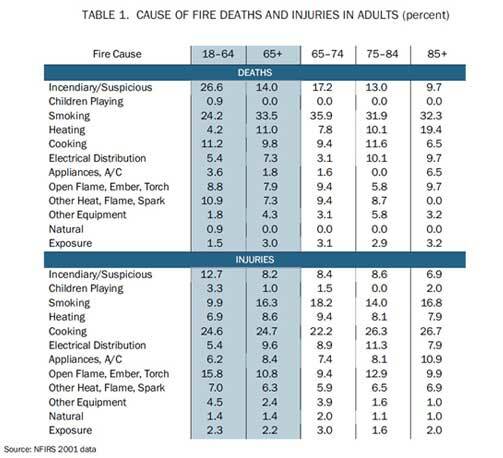 — Smoking fires are the leading cause of fatalities among the elderly; cooking fires are the leading cause of injuries. — Older American Indians and African Americans are at much greater risk of dying in a fire than the older white population. –Older males are 50% more likely to die in fires than women. –The elderly are more vulnerable in a fire than the general population due to a combination of factors: mental and physical frailties, higher alcohol usage, greater use of medications, higher smoking incidence, and elevated likelihood of living in a poverty situation.